In 2015 I was lucky enough to grow Cream Mandarine XL Auto® (SWS55) with amazing results, obtaining plants that yielded more than 130 gr. of high quality dried flowers. Outstanding taste and effect. I’m sure this strain will also be a big champion due to the genetics used as parentals. S.A.D. Sweet Afgani Delicious Auto® (SWS24) contributes with a slightly more homogenous and stable structure to the other strain used in the cross, the Amnesia Haze, “Cordobesa” clone. The taste, effect and growth pattern of this plant totally surprised me as it is absolutely equal to the best plants from feminized or regular seeds that I tried before. Now I’m going to tell you with a bit more detail about growing this magnificent and beautiful plant in which I fell in love with. For growing this variety the chosen soil was Kilomix from Atami, which contains enough food for one month. Then I used BioCanna nutrients in every moment as the plants demanded it and realized that Blow Mind Auto® is definitely a plant that needs a lot of food. All the plants were grown in Airpot containers with manual watering and without adjusting the pH from the nutritional solution. For lighting I used a 400W Metal Halid lamp for the first 10 days, changing it then to a 600W HPS after the 11th day which was used from then until harvest. The ventilation and extraction worked 24 hours per day, everyday. To control the temperature I used a heater with thermostat so that the temperature never went down under 17ºC when the lights were off, because they were grown in the winter. One of the most important steps, as you might well know, is the germination of our seeds, because we expect to germinate 100% of them as we payed an amount that ensures us that they are fresh and that they will deliver a good final quality. In my case I always use the same method with outstanding guarantees of success and, except when the seeds are extremely old or badly stored, the germination occurs in 100% of the cases. It is very simple. I fill a glass of rested water, then drip a bit of hydrogen peroxide and finally I drop the seeds (they should float in the water). Later I put the glass on a warm place, always making sure that the temperature does not go above 22ºC. I also like to use the package of the seeds to cover the glass, helping to preserve as most humidity as possible. I keep it closed for 24 hours and, after that, I uncover it to check how the seeds are doing. Although it is also easy to check if the seeds have sprouted by simply looking through the glass. If at this point they still don’t show signs of germination, I change the water to avoid mold problems that could affect the seeds. All the seeds sprouted in less than 48 hours and then I planted them in Jiffys, previously soaked in warm rested water. At this same moment I usually put the Jiffy inside a small pot with a bit of soil, so that the plant can wait for at least one week before it is passed to its final pot. In this case I used three 20 L. pots and six 10 L. pots. In the first week we should pay constant attention to the plants to make sure that they don’t dehydrate. I kept a daily watering routine with the nine plants under a 400W MH light. They were under this light until I transplanted them at day 8, when they were taken to the flowering room with a 600W HPS light and their final pots. Setting the ventilators to a moderated speed and then pointing them directly towards the plants was also very important as it helped the plants to grow strong since the beginning and not stretchy at all, as it happens in many cases. To avoid this, as you might well know, it is advisable to use an adequate light that was not used too many times before and to add a continuous air flow to it. This invites the plant to develop more cellulose and consequently a stronger structure and main stem. With this, the plants will also need more water so you should pay close attention to it. At this stage all the Blow Mind Auto® plants developed almost equally, with great vigour and a lot of health. Still no need to feed them with liquid fertilizers until this moment because the rich soil was still enough to satisfy the plants’ needs. They were transplanted to the big final pots and, at the same time, they were put under the 600W HPS light. It is very important to keep track of that day in your calendar because it may help you to know until which point the plants can get all they need from nutrients present in the soil. If you follow this rule and, for example, the soil that you have bought has nutrients for one month, you can relax because you know that during that first month the plants will be correctly fed. Which does not mean that some plants may not need a bit more feeding and other plants a bit less. But in general cases it is a very good guideline if you use good quality soils. You can add a biostimulator as long as you do it with moderate doses and only when the plants need it. For example, it is adequate to add root biostimulator during the first 15 days and then keeping with it in low doses until almost the final stage of flowering. One thing that will help us to get fatter flowers out of our dear plants is adding a flowering biostimulator since the first days of flowering, which usually coincides with their third week of life. In this grow I used BioBoost as flowering stimulator from day 21 to harvest. At day 31 after the last transplant some plants were already showing signs of nitrogen deficiency, with a yellowish tone in some big older leaves of the lower branches. In my case there was no need to use any growing fertilizer because when this happened the plants were already almost in their fifth week of life, a moment when fertilizers rich in phosphorus and potassium are more important and necessary for the plant. These fertilizers help the plants to produce a higher quantity of big flowers, while the fertilizers rich in nitrogen tend to accumulate and generate problems in the flower formation. In this moment almost all the plants are taller than 70 cm. And in some of them I had no alternative but to do a bit of LST in order to lower their height, or else the smaller plants would not receive the same light intensity as the taller ones. Lots of leaves and exuberant production of side branches make it possibly one of the most sativa autoflowering strains that I ever had the pleasure to grow. Something that is very noticeable since early stages of growth of this amazing genetic from the Sweet Seeds collection. Between the fifth and the seventh week I used a bit of organic bloom fertilizer, in this case it was Bioflores once every two times I watered the plants. All the plants responded well and none of them showed signs of overfertilization. At this point we are at the moment when the plant starts to show all its potential, finishing the vegetative stage but at the same time fattening up and maturing its flowers. The shape of the flowers is clearly characteristic of sativa strains, with a long appearance and tremendously covered with aromatic resin that invades the room with floral, citric and very scented aromas. Also at this stage, we can see that all the pistils are still white and no mature pistils can be found. But what is more interesting to see is how all the leaves that surround the flowers are totally covered with trichomes! In this moment it was easy to appreciate that two plants stopped growing to focus their energies in fattening up their flowers. These were placed exactly under the lamp because otherwise the other plants that were still growing could partially block the light. Now I’m using the maximum dosage of flowering fertilizer, the flower biostimulator and half dose of root biostimulator. This helps me to compensate the acidity of the nutrient solution and to keep the roots in optimal conditions. 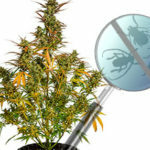 Using Cannazym once a week for a while, also helped the plants to correctly use all the nutrients that they were given, because it helps a lot when it comes to keep a clean and biologically active soil. 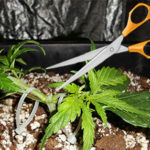 As Blow Mind Auto® produces a lot of side branches, it is advisable to cut the two or four lower branches that will not grow tall enough and where light can never reach. Like this the plant can avoid spending energy on these sites and use it instead in the flowers from the top, while keeping the grow cleaner and better ventilated. The temperature was stable for almost the whole cycle, never going above 25ºC and never going under 17ºC. This, together with the dryness produced by the Airpots, forced me to water the plants once every two days in the moments of maximum necessity. When we were about to reach to the 7th week, the height of the plants was of 1 metre approximately. The plants are totally developed with multiple branches and trichome filled flowers. The trichomes are milky, starting to turn transparent in some higher parts of the plants. I didn’t wanted to abuse from the liquid fertilizer, so after the 7th week I stopped using Bioflores, keeping only with BioBoost and half dose of Rhizotonic. The buds already show a considerable size and it is in these last weeks that this beautiful strain explodes. Literally. If you are patient, leaving nature to follow its path, when getting into the 8th week you can start washing the soil. 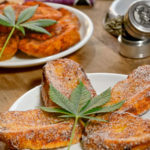 With this, the plant will consume all its own reserves and the taste will not be altered by chemical residues that were not clean from the soil. All the plants matured equally at the same timing and by the 9th week I started to harvest some of them. The yield is amazing but what most calls to my attention is the appearance and the smell of this marvellous autoflowering from Sweet Seeds. I will have to wait for a while until I can taste these precious buds in their maximum splendour, because I usually cure them for around 3 months, but I could not resist to try a flower to make a small smoke report and share with you ? After crushing the bud to pieces the traditional touch of potent high quality cannabis becomes noticeable, with a citric hint, a sour touch, something spicy but sweet… definitely a work for sommeliers with a delicate sense of smell! I hope you enjoy this autoflowering as much as I do.